A 5.0-magnitute earthquake has struck near the east coast of Honshu in Japan not far from the infamous Fukushima nuclear plant. The tremor hit some 18 kilometers southeast of the city of Hitachi and 125 kilometers northeast of Tokyo, at a depth of about 50 kilometers. The epicenter is some 150 kilometers from the Fukushima nuclear power plant. There were no immediate reports of casualties or destruction. The crisis continues at Fukushima plant after it suffered triple nuclear meltdowns and hydrogen explosions since it was hit by an earthquake, followed by a tsunami, in March 2011. Three reactor cores at the plant melted down in the catastrophe and need to be cooled constantly to avoid possible escalation. 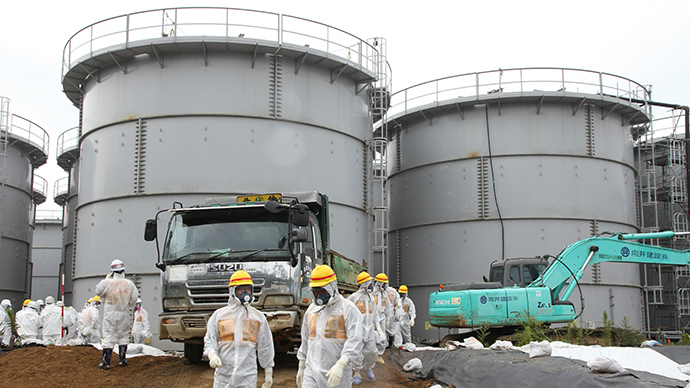 Fukushima operator, Tokyo Electric Power Company (TEPCO), has been unable to prevent regular leaks of highly radioactive water from cooling tanks into the Pacific Ocean, raising international concerns. On Wednesday, the radiation at the crippled facility reached 1,200 becquerels per liter, which is the highest indication recorded since late 2011. The International Atomic Energy Agency announced that it’ll monitor the radiation levels in the nearby ocean urged Japan to share its data on Fukushima radiation levels. Previously, Japan kept the international community in the dark on the situation at the disaster-hit nuclear facility, only acknowledging contaminated water leaks in July.